* Lost post provided via Google cache, but mostly thanks to my friend Elizabeth from Friday night knitting @ Starbucks in St Paul, who is wise in the ways of the web. Thanks, Elizabeth! As previously reported, the surgery went swimmingly. I was in the hospital for three nights. Could have gone home one night sooner, but I saw no reason to abandon the place where the bathroom was 3" from the bed. Recovery at home went fine, too. Smokey is a [good] nurse. I have been walking unassisted by cane or walker since late last week. Yay! Saturday morning I was completely pain-free for the first time. Yay! Of course, I took that as a sign I could walk around more. On the other hand, such pain as I have now is minor. Yesterday Tuesday I skipped pain meds all day until bedtime. Yay! Now for the downside issues. Those are more interesting, anyway. I had an allergic reaction to Celebrex, an NSAID given to me to reduce inflammation. What it did do was give me the super-itchies all over. My eyes swelled, my back and legs were purple with hives, I itched EVERYWHERE. The visible signs of that are largely gone now, although I still itch, especially on my upper arms and torso. The aftermath of the reaction was been rather like getting a minor sunburn — I peeled everywhere that had itched. Sorry for the blurry photos — it is tough to take pictures of one's own fingertips. 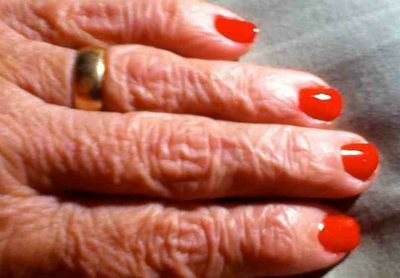 Something, either the reaction or the salves and lotions that were prescribed to counteract it, have given the affected skin the crepey character of an 80-yo, even though it is immeasurably enhanced by my summer nails. This seems to be slowly going away. Yay! Other main problem is lack of stamina. Getting up and dressed and making and eating breakfast is enough to send me back to bed for a nap. All these drugs — oxycontin, coumadin, vistiril, lopressor — have some minor side effects. My body cannot decide if it is warm or cold and has decided instead to go back and forth between the two in an unpredictable manner. I thought I had finished with hot flashes years ago. Oddly enough, the surgery and/or anesthetic affected my bladder control. Happily, I no longer need them. I have to be extra vigilant about every single urge. Also have to avoid coffee, tea, orange juice, and Coke Zero. I have discovered that neither Fresca nor root beer seem to have whatever it is that irritates/stimulates my bladder. Still not as good as coffee or Coke Zero. No alcohol at all until I am done with the Coumadin/warfarin/blood thinner/rat poison. On Saturday my friend Colleen and her husband came over. She watered and fertilized and deadheaded my hanging pots and planted the herbs that I hadn't managed to get into pots before the surgery. She also bought me a rose bush. Another friend is coming over on Friday afternoon to sit and knit on the deck with me. Friends are a good thing to have. This entry was posted in Hip replacement. Bookmark the permalink. Wow, a friend that does yardwork for you IS a good friend! That’s weird about your skin… could you be dehydrated? Maybe not getting as much fluid as usual in an attempt to manage the bladder control issue? What do I know, though, really. Can’t look at that photo of your hand! Yay friend! Yay roses! Yay herbs! LOL for real about Oxy having “minor side effects.” I’m sorry to hear about the Celebrex reaction. Those elderly people in the ads turning cartwheels made it look like the best drug in the world. :0 Take it easy! Rest often! Glad to hear you’re doing well. Hope you are feeling better soon – friends are the best medicine! Hugs, dear friend. Have been missing you. Oh dear. The allergic reaction is awful. Glad you are feeling better though.